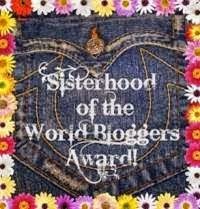 Bingeing On Books: Sisterhood of the World Bloggers Award! Thank you so much Lisa from Captivated Reader for nominating me for this award! I really appreciation this nomination. 1. Thank the blogger that nominated you, and link back to their site. 2. Post the award's logo onto your blog. 3. Answer the 10 questions you've been asked. 4. Nominate 10 other bloggers and ask them 10 questions. The following are my answers to the questions Lisa at Captivated Reader asked her nominees. 1. What book series have you read or are currently reading that you would recommend to other readers? 2. Do you listen to audiobooks? If so, which one would you highly recommend? Ahh, unfortunately not. I tried one time but couldn't get into it. Maybe it was the narrator. I am thinking I will give it another try though. 3. What are you reading (or listening to) now? The ARC for Vivian Apple at the end of the world by Katie Coyle . . . It's really good so far! 4. What's your favorite comfort food and/or beverage to enjoy while reading/listening to a book? 5. What do you most enjoy about blogging? I love being able to fangirl about all the books I love and push them on others (see #1!). I also love meeting other people and getting awesome book recommendations. Blogging is murder on my TBR pile. 6. Which author would you most like to meet? Margaret Atwood, for sure! The Handmaid's Tale is one of my favorite books. I have also read a few of her interview quotes and she seems like the coolest lady. 7. What's your least favorite genre to read? I think that would have to be religious fiction. I am not a religious person so I am just not a fan. Hard to say since I am temporarily living in Italy. Until last year, that was my dream vacation! What I really want to do is an African safari. There is also a place in Kenya, called Giraffe Manor where the giraffes roam the estate and even poke their heads in the rooms. How cool would that be? 9. Do you like novels with predictable and/or happy endings? Depends on the book. The short answer is yes I do love a happy ending. But I don't go all crazy when a book I love has an unhappy ending (well, not always). Here are the bloggers I am nominating. These are just some of the bloggers I visit on a regular basis. 6. Nobody at The Story Goes . . .
1. If you were a character in a book, who would you be and why? 3. Who is your favorite author? 4. Describe your favorite reading spot. 5. What is your favorite book to movie adaptation? 7. Which book do you recommend the most and why? 8. Do you prefer coffee or tea? 9. Fun fact about yourself! 10. Rough estimate, how many books are in your TBR pile? Thanks Joyous Reads! I am thinking the problem with the one I got was the narrator so I may give them another chance. I would like to meet Margaret Atwood as well. I would also like to visit Giraffe Manor too. I've heard about this place and seen video footage of this place and it looks amazing. I will most definitely have to check out the Wayward Pines Trilogy. Thanks! I really hope you read the Wayward Pines trilogy. It is so good!! Thanks for the lovin, hun! Your blog is lovely! :) And lucky you I really want to visit Italy! And Greece! I love Italian food too so I would be in heaven! Thanks Giselle! Yes the food is amazing here. I have plans to see Greece soon. I hear it's beautiful. Also, you should definitely give audiobooks another go - I reckon non-fiction/memoirs are a good way to ease yourself into the format. Thanks! I can't wait to see your answers! Ah, I am right there with you on not liking religious fiction. And I can't do audiobooks either. It seems like cheating ;) That Kenyan Giraffe thing sounds AMAZING. I hope you are able to go someday! And I am glad you're enjoying Vivian. She didn't quite do it for me, but I am glad she's working for you! First of all, sorry it took me so long to check this out! I will be doing it as soon as possible and thanks so much for nominating me! It's Monday. What are YOU reading?? Bout of Books Challenge - Book in Pictures! Bout of Books Synopsis Challenge! Bout of Books Read-A-Thon Final Update! My dog loves to read too! 2015 New to You Reading Challenge! First Book of the Year! !